Premier League giants, Manchester United are still interested in signing towering Serbian defender, Nikola Milenkovic. The 21-year-old has emerged as a target for United in recent weeks and has been the subject of scouting missions by the club. The Fiorentina centre back has been on the radar of United for a while and was scouted personally by manager Jose Mourinho while he was playing for Serbia in an international game against Montenegro. United are in the market for a new centre back following the inability to add defensive reinforcements in the summer transfer window. That led to United being shaky at the back, conceding 21 times and keeping just one solitary clean sheet in 12 league games. 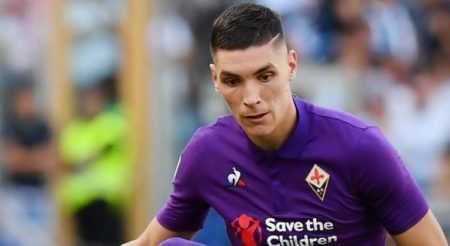 Milenkovic has attracted interest from around Europe with his mature displays for Fiorentina and is also established at international level with Serbia. He is reportedly on a meagre £12k-a-week offer in Florence, which would be substantially increased were he to move to Old Trafford. The Daily Mail reports that United will send a scout to watch him again this weekend when his team travel to Bologna for a Serie A game this Sunday. Fiorentina president, Pantaleo Corvino values him at around £50m, which is comparably cheaper than the prices United have been quoted for Kalidou Koulibaly of Napoli and Harry Maguire of Leicester City. He is also a close friend of international teammate, Nemanja Matic who will no doubt help him to settle at the club should a deal goes through. Milenkovic is a tall centre back that can also play at right back. He is very good on the ball and is being touted as one of the best young defenders in European football.